SM Faliq SM Nasimuddin posing with a replica project of The Valley TTDI. SHAH ALAM: Property developer Naza TTDI Sdn Bhd’s current unbilled sales of RM1.5bil will sustain the company for the next three to four years. Group managing director SM Faliq SM Nasimuddin said that besides the launch of The Valley TTDI, the company would be launching two new projects in Kajang and Shah Alam this year. The Valley TTDI in Ampang is an upmarket, exclusive residential development targeted at middle and upper end buyers seeking a premium green address in Ampang. With a gross development value (GDV) of RM393mil, the project comprises double-storey linked villas and bungalows with prices starting from RM2.5mil. “We managed to sell about 50% of the units during our recent soft launch. I believe if you continue to have a good track record and reputation, buyers will buy as they feel confident with the company and the products offered,” he said, adding that last year the company managed to chalk up sales of RM239mil. Faliq said most of the buyers were locals and the company showcased the project in Singapore last month and would be going to Beijing later this month to attract more foreign buyers. The TTDI Kajang will have a GDV of RM339mil while the GDV for TTDI Alam Impian is RM1bil. Both TTDI Kajang and TTDI Alam Impian targeted the middle-income group, he said. Other ongoing property projects by Naza TTDI include Laman Seri Business Park (GDV of RM131mil), Laman Seri Business Suites (RM51mil) and Jayamas II (RM25mil) in Shah Alam, the 38-storey Platinum Park (RM466mil) and Menara Felda (RM640mil). “We also have about 480 acres across the Klang Valley for our future developments. Though the size may be small, the locations of our land are quite strategic,” Faliq said. To woo more buyers, Faliq said the company was teaming up with banks to provide more attractive loan packages such as having schemes like the 5:95 promotion, where buyers need only pay 5% for the downpayment and would only continue to pay the rest once the house was ready. 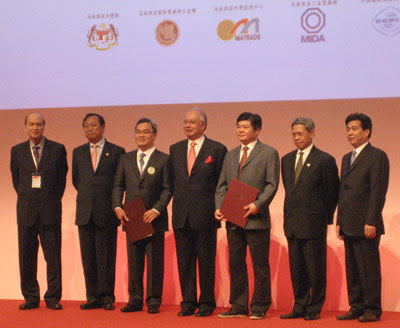 Naza TTDI, acquired from Danaharta in 2004, is the property arm of the Naza group. Established in 1973, the company’s first major property development was Taman Tun Dr Ismail in Kuala Lumpur. SP Setia Bhd has entered into a cooperation agreement with Hangzhou Ju Shen Construction Engineering Ltd for a 25-acre mixed property development project in China. The signing was witnessed by Malaysia's Prime Minister Datuk Seri Najib Tun Razak who is on his first official visit to China, the company said in a statement today. "This cooperation marks the start of the group’s foray into China and this will be our third venture overseas after Vietnam," said SP Setia's president and chief executive officer Tan Sri Liew Kee Sin. 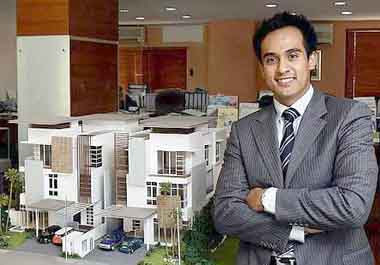 The venture was in line with the group’s expansion plans to be an international property player, he said. Liew said it was still too early to reveal more details of the joint venture including the proposed investment, shareholding of the parties involved and project cost. The project, he said, is located in the growth corridor of XiaoShan and Hangzhou in the province of Zhejiang. BEIJING: SP Setia Bhd has entered into a co-operation agreement with Hangzhou Ju Shen Construction Engineering Ltd to set up a joint-venture company to carry out a mixed real property development project on 25 acres of land in the growth corridor of XiaoShan, Hangzhou in the province of Zhejiang, China. Prime Minister Datuk Seri Najib Razak, who is on his first official visit to China, witnessed the signing of the agreement today. SP Setia was represented by its president and chief executive officer Tan Sri Liew Kee Sin while Hangzhou Ju Shen Construction Engineering Ltd was represented by its legal representative, Hu Baifu. In a statement today, Liew said the co-operation agreement marked the group's foray into China. This will be the company's third venture overseas after Vietnam where the company is developing EcoLakes at MyPhuoc Industrial Park, 42 kilometres north of Ho Chi Minh City and EcoXanh at Saigon Hi-Tech Park in District 9 of Ho Chi Minh City. "This venture is in line with the group's expansion plans to be an international property player," Liew added. However, Liew said it was still too premature to reveal more details of the joint venture, proposed investment and shareholding of the parties or the development with regards to costs, commencement as well as completion. Hangzhou, located 180km southwest of Shanghai, is the capital of Zhejiang province as well as a key tourist and historic cultural city with a population of about 6.78 million. With a population of about 1.16 million, Xiaoshan is the biggest district in Hangzhou and is located at its southern gate. PROPERTY developer Glomac Bhd is organising a property campaign for both its residential and commercial development from June 6-July 31. The campaign, Glomac 21st Anniversary Property Campaign, offers three residential township developments in Bandar Saujana Utama, Sungai Buloh, Saujana Rawang in Rawang and Sri Saujana in Johor, the company said in a statement today. Also included in the campaign are commercial developments, including Glomac Galleria in Sri Hartamas, Plaza Kelana Jaya, Plaza Glomac(Kelana Jaya) and Glomac Damansara (Kuala Lumpur), Glomac said. The company said its newly launched Glomac Cyberjaya is also open for registration. The campaign will also feature high-end, exclusive full-featured freehold condominiums, located in the Kuala Lumpur City Centre area known as Suria Stonor, double storey terrace house called Seri Bangi in Bangi and exclusive semi-D’s and bungalows in Suria Residen, Cheras. Several incentives are available to purchasers, such as a 100 per cent financing loan, zero per cent interest during construction, free sales and purchase agreement and loan documentation, early bird discount and RM500 for successful introducers. KUALA LUMPUR: DutaLand Bhd has entered into a memorandum of understanding (MoU) with China-Boda Group to jointly develop two separate pieces of land in Hebei Province, China and in the Iskandar Development Region. In a filing to Bursa Malaysia on June 4, DutaLand said the development of the 151.5ha piece of land in China would be developed over two phases. "Phase 1 consists of a mixed development project with a total estimated gross development value of 6 billion yuan (RM3.1 billion)," it said. The land in the Iskandar Region is located at Mukim Plentong, Johor Baharu and measures 15.25ha, it said. DutaLand said the proposed joint venture would be carried out through the formation of two JV companies incorporated in China and Malaysia, respectively. It said the company incorporated in China would have a proposed paid-up capital of 100 million yuan on an equity basis of 30:70 between DutaLand and Boda Group respectively. The Malaysian company shall have a proposed paid-up capital of RM50 million with an equity participation of 70:30 between DutaLand and Boda Group, it said. DutaLand and Boda Group are expected to sign a formal joint venture agreement within six months from the date of the MoU, it said.